Finally at long last my own fan art added to my wallpaper series. I don't think this will be the last time I do this either. So please enjoy this as much as I did making it. 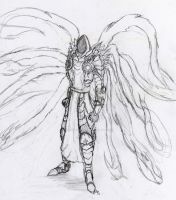 Expect another wallpaper of this tyrael image soon just as a simple image. I know there will be some out there who will want it. Originally drawn free-hand with a .07mm Mechanical Pencil.